ALLEGRA BOVERMAN/Staff photo. Gloucester Daily Times. Gloucester: The Cape Ann Theatre Collaborative presents A.R. 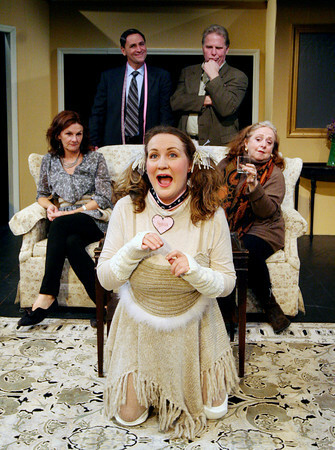 Gurney's comedy "Sylvia," at the Gloucester Stage Company. Clockwise from center front, is Julie Cleveland as Sylvia, Emily Sinagra as Kate, Cliff Blake as Greg, Tom Adams as Tom, and Jennifer-Lee Levitz as Phyllis. Missing from photo is Michael McNamara as Leslie.